These really should break some sort of chocolate rules. They really should. So we went to Steve’s company picnic recently and we were slated to bring dessert. I had every intention of making triple layer mint brownies. Also known as Grasshopper Brownies. But I got lazy. In truth, I ran out of time! I made the brownies part in the early morning. (Nothing like baking chocolate at 8 am.) Let them cool for a bit and put them into the fridge. Then I went to the eye doctor…got myself some new daily contacts…and returned home to make the mint layer. No problem…mint layer is on. And I look at the time. ACK! So perhaps a potluck in the middle of the winter (instead of an outdoor picnic in the heat of the summer) would be a better time to make and take these brownies. Either way, you’ll love them. I promise, promise, promise…you’ll love them. Make brownies as directed on the box. Let cool and then place in the fridge to chill. In a mixing bowl or stand mixer, mix together all the ingredients for the mint layer. Spread onto the chilled brownies using a plastic spatula or frosting spreader. 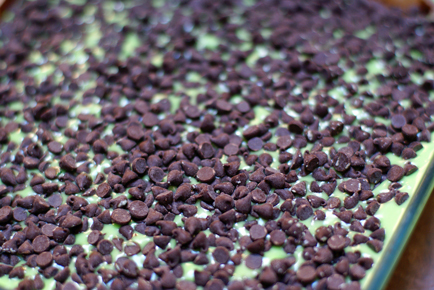 Sprinkle the mini chocolate chips over the mint layer and spread them out to cover the mint layer. Gently press in to the mint layer. Chill in the fridge for at least 30 minutes, or toss into the freezer for 10 if you are pressed for time. If you plan to chill them longer, cover with foil before chilling. Serve chilled. Bedazzle your friends and family! Your recipes are wonderful… I am making these brownies this weekend.. a DOUBLE batch…. Love your site and your cookbook is my Xmas present to all my friends and sisters this year… It’s been a total lifesaver for me and my brood!!! ( I have 6 children… so always lots of hungry bellies around here). Thanks again… You are awesome!!! I love mint brownies…but my hubby hates mint. I don’t ever make them out of self preservation. Because I know I’d eat the whole pan. Chocolate and mint are such classic flavors, like chocolate and peanut butter. Nothing beat great flavor combos when wanting a comfort dessert and this sure is one of them. Made these today for a st. patty’s party but I found the frosting to be dry when I made it. Did anyone struggle with that? I had to add milk to thin it out to spread. Did you melt the butter?